Present state: The roadside booking office and station house survives in private occupation. The station area has been landscaped as part of a housing estate. The level of the land has been raised probably covering the platforms. A short platform remnant survives at the portal of Crescent Wood Tunnel and a remnant of the other platform survives inside the tunnel..
Notes: Upper Sydenham Station was located within a curve of the Hollow Combe Ridge between the Crescent Wood and Paxton Tunnels. 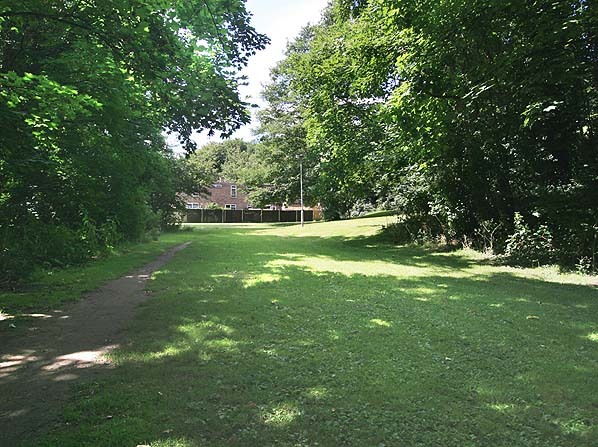 The booking office and station house was located on the ridge in Wells Park Road with steps and a path running down the side of the Combe to the platforms; this path was prone to regular land slips. The station served an area of large well separated villas with ample gardens. surroundings of Upper Sydenham saw only 211 up passengers and 216 arrivals the whole day. and Honor Oak (1st December 1865) and a further station was opened at Nunhead on 1st September 1871 to cater for a new housing development. Despite the terminus being conveniently sited, the branch came too late as the Crystal Palace excursion traffic was already falling as the Palace failed to attract the expected visitors. In 1866 a fire destroyed the north transept of the Palace and it was never rebuilt and a strong and successful opposition to Sunday opening further damaged its commercial prospects. who had demanded restrictions prior to the building of the line imposing special architectural treatment of some of the railway structures. In 1908 there was further competition after the introduction of electric trams and later busses. 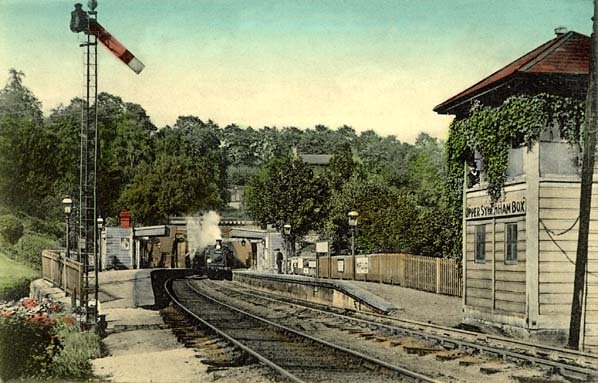 Looking north at Upper Sydenham Station in c.1906. 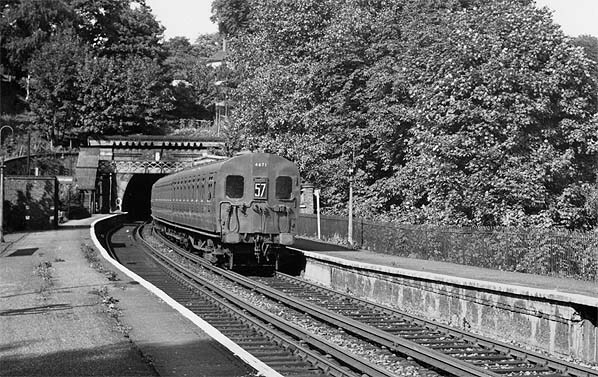 The south portal of Crescent Wood tunnel can be seen beyond the station. 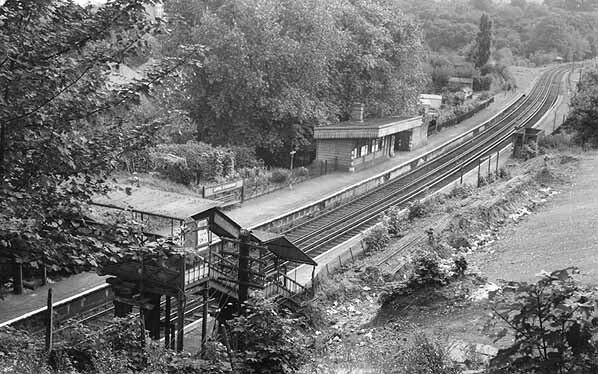 Looking north at Upper Sydenham Station in the early 1950's. 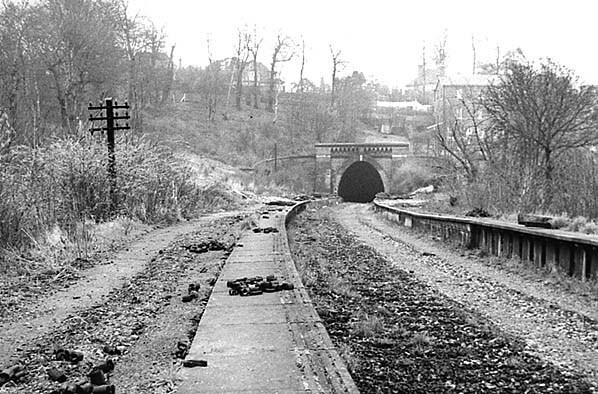 The south portal of Crescent Wood tunnel can be seen beyond the station.